Recently Skype beta 4.0 has been released, so thought of sharing a quick review. The new Skype is all about making it easier to stay in touch and feel closer to friends who are far away. Skype's Beta (or Windows PC only)has significantly changed the layout with more emphasis on communication instead of voice. 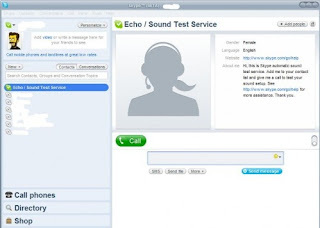 The peer-to-peer technology ensures good quality video, and there is more space available for text chatting or sending files while the conversation is going. The other major change in Skype 4.0 is that the entire experience is now centered around conversations and managing those conversations, whether those are with groups or individuals. Skype, which is owned by eBay, boasts 309 million registered users and had $126 million in revenues in the first quarter.